During laser treatment, your skin will naturally turn a frosty white colour. 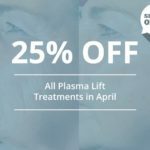 This is caused by the carbon dioxide being released as a result of laser penetration and surfaces on the upper layer of the skin and usually only subsides after twenty minutes. During the removal process, the laser will heat up ink particles in your skin, which can cause tiny blood vessels to break around the tattoo. As a result, superficial blisters containing water and ink may appear. In fact, blisters are quite normal and an indication that the healing process has begun. They might not look too pretty and could be tender to touch, but blisters should take between 3-14 days to heal up completely, providing you don’t burst them! Yet another sign that the tattoo removal is working, scabs often collect fragmented ink particles and usually appear 8 to 72 hours after the area has been treated. When the scab falls off, the top layer of ink will come with it. Picking at or peeling off scabs can increase the risk of scarring, so however tempting it might be, try to avoid this. A lot will depend on the size and location of your tattoo, but most scabs will disappear within two weeks. Our body’s natural defence system will react to things like illness or infection in a number of different ways. But while swelling usually occurs after being bitten by an insect or twisting your ankle, it can also happen after undergoing laser tattoo removal treatment. The heat from the laser will catalyse swelling, but just like any other type of swelling, this will go down once your immune system realises there is nothing wrong. If anything, be grateful that your body is alert and aware of potential dangers. While a lot will depend on your personal pain threshold, it is fair to say that the majority of people will experience discomfort to a certain degree. 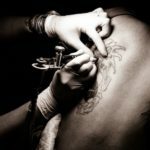 The level of discomfort also depends a lot on where the tattoo is located; tattoos on more fleshy areas of the body will hurt less as the flesh acts as a cushion, whereas tattoos on areas such as the wrist, feet, face and fingers could make you wince a little more than if your tattoo was on your thigh! 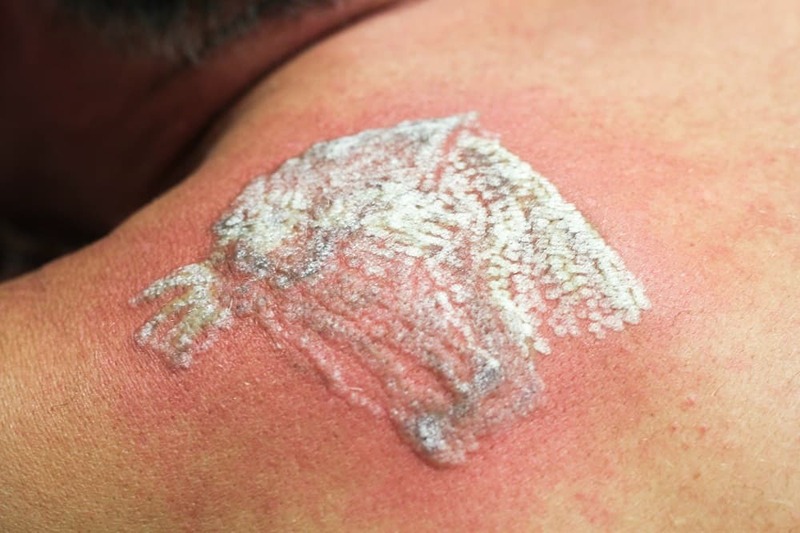 When laser tattoo removal first came to market, it received a bad reputation for being incredibly painful. But patients who have received removals from the latest and greatest PicoSure laser have said discomfort levels are up to half that of alternative treatments. In general, the discomfort is commonly compared to an elastic band being slapped against your skin. Again, this should be seen as a good sign, as your immune system is kicking in and starting to heal the affected area. An itching sensation is common, but just like any other type of skin irritation, you must try your hardest not to scratch the area. Scratching could impact on the effectiveness of removal. You may also break the skin and create a wound, which will lead to additional scarring or risk infection. Generally, you should not apply creams or lotions to the area, but if the itching is unbearable, ask your laser operator for advice. Given the technological and medical advances in laser tattoo removal, permanent scarring is rare and occurs in less than two per cent of cases. If scarring does happen, it usually isn’t that noticeable and can be minimised with Vitamin E oil or over the counter silicone patches. Just make sure your skin has fully healed from the treatment before applying cosmetic products. In order to minimise the chance of scarring after treatment, drink plenty of water, get enough sleep each night and quit cigarettes if you happen to smoke. These measures will boost your body’s immune system and help the process of pigment elimination and skin repair. Also, try to avoid direct exposure to the sun, as ultraviolet radiation can harm your skin’s pigmentation and increase the risk of scarring due to greater sensitivity. Keloid scars, which are raised, thickened areas of skin can appear up to 3 to 6 months after treatment, but these are very rare. During laser removal, pulses of different light wavelengths are used to remove the tattoo ink. However, it can also affect your skin’s natural pigment or melanin. A consequence of this is known as hyperpigmentation, which are essentially patches of darkened skin. This condition is typically seen on people with darker skin and active tans which will usually resolve itself. However, there are cosmetic products available to help even out skin tones. Conversely, hypopigmentation is where your skin’s normal pigmentation has been removed. As a result, lighter patches of skin will be visible where the tattoo once was. It can sometimes take months or even years for your skin’s pigment to appear normal again. For some people, it may never be the same. However, both hyperpigmentation and hypopigmentation are bound to be more tolerable than the actual tattoo. Seeing as laser removal treatment doesn’t actually break the surface of your skin, the risk of infection is low, especially if you follow the aftercare instructions set out by the laser technician. The risk of infection is increased if you burst blisters or pick at scabs, so avoid both of these. In the event of infection, contact the laser technician or your doctor. Laser tattoo removal does not generally affect your muscles, so this side effect is uncommon. But a lot will depend on the treatment area and you could develop a little bit of soreness. If it feels tender, you can always apply a cold compress of ice or a pack of frozen vegetables from the freezer wrapped in a clean cloth. Applying ice directly can burn your skin while muscular pain relief products like Deep Heat shouldn’t be used. Even though there are quite a few possible side effects to laser tattoo removal, most of the aforementioned issues are uncommon with most patients. What’s more, if problems do occur, the majority of them are treatable or not too distressing. Just remember to follow the advice your laser technician provides before and after the procedure, as this will improve the treatment’s effectiveness and minimise the risk of suffering from side effects. In many respects, it is just like getting a tattoo, but in the end you’ll be left with unblemished skin rather than a permanent piece of ink. How does the PicoSure Laser Work to Remove Tattoos?